With the New Year in full swing, you may be taking a look at your finances as part of your resolutions. If you don’t like what you see, there is something that you can do. Here are some tips for a quick-fix financial diet to help you get your finances in order for the new year. Please note that this is not intended to be a long-term solution. This is a temporary lifestyle change in order to get your finances to a manageable place. You may think because you aren’t making much money that a budget isn’t necessary. However, the less money you have, the more important a budget becomes. It is vital that you track your spending and know where every single dime you make is going. After tracking your spending, find areas where you are able to make some cuts. Necessary expenses, such as mortgage/rent or groceries are non-negotiable, but maybe you spent a little more shopping than you remember or perhaps you have multiple streaming services. If something isn’t 100% necessary for your survival or it won’t help your financial situation (i.e. paying off credit cards) cut it. Remember, this is only temporary. Once you gain some control of your budget, you can start including SOME funds for entertainment or other non-necessary expenses. Credit cards are only to be used for emergencies during this time. If you can’t afford something right now, you’ll either need to wait until you can relax your budget a bit or you’ll need to move on. 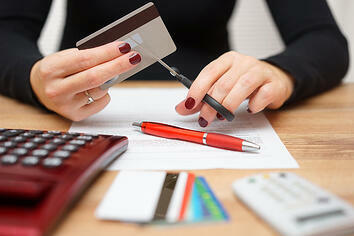 Adding more credit card debt on top of your existing financial problems is only going to add stress and more cost. When paying off your credit cards, start with those with the highest interest rate as this will help you save money over time.